When you're present and aware you notice things, tiny little things. Today I noticed some first signs that Spring is not too far, far away. 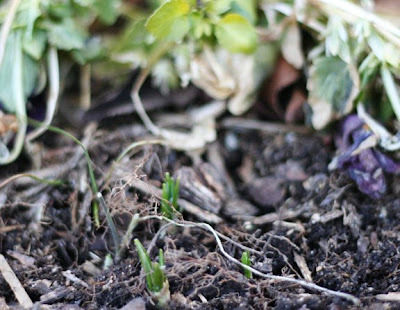 Tiny, little crocus and daffodil buds, breaking through the earth about a 1/2 inch. Seeing these made me giddy. Plus the fact that it was like 55 degrees out today. Funny how when you go from 70 degress to 50 degrees, 50 is cold. But when you go from 30 degrees to 50 degrees, 50 is warm and balmy. I'm not delusional though. I know we are just only half way through winter. It's even supposed to snow tomorrow night. 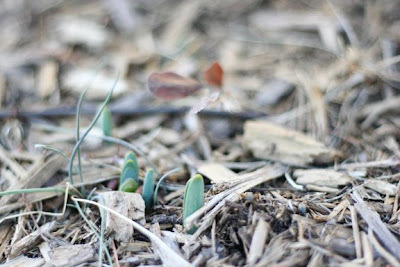 But seeing these little buds gives me hope and faith, that soon enough winter will be over. The days are also a little longer and soon another sign that Spring is approaching will be here. Girl Scout Cookies. it's true about going 70 to 50 and we're freezing but 30 to 50 degrees and we're acting like it's the dead of summer. I spent the entire day outside with no coat and flip flops on! And people in Adams Morgan were out running with no shirt and shorts on! It's was a fantastically warm and sunny day. Definitely good for the spirit.